An historic event is scheduled to take place May 11-13 when the Antique Automobile Club of America and the Classic Car Club of America plan to stage their first joint national meet. An historic event is scheduled to take place May 11-13 when the Antique Automobile Club of America and the Classic Car Club of America plan to stage their first joint national meet. 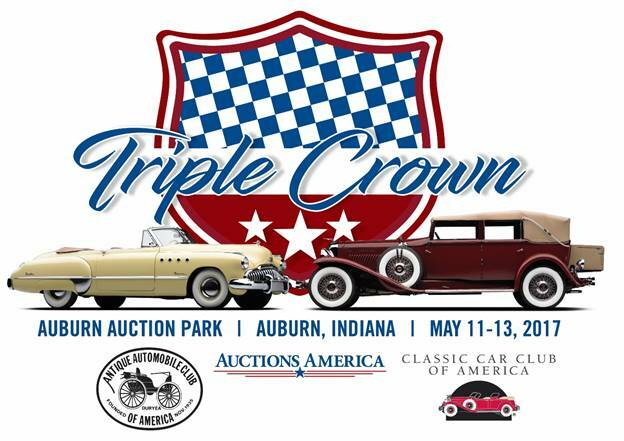 The “Triple Crown” Meet is to be held in conjunction with Auctions America’s annual Auburn Spring weekend at the Auburn Auction Park in northeastern Indiana. “We are all about history. We collect history. We drive history. At the Auburn AACA/CCCA meet, we will make history,” Tom Jones, the CCCA president, said in an Auctions America news release announcing the event. The schedule for the weekend will include visits to four local collector car museums, to the auction and adjacent flea market, as well as judging schools and seminars, the joint car show, a concert and an evening barbecue and awards presentations. The AACA, based in Hershey, Pennsylvania, was founded in 1935. The CCCA, based near Chicago and with its museum in Hickory Corners, Michigan, launched in 1952, largely by car owners whose vehicles weren’t included within the AACA’s definition at that time of what cars were true classics. But times and attitudes and even definitions change. The AACA has held a spring meet at Auburn for several years. Moskowitz told Classic Car News that someone suggested to him that there was no reason why the CCCA also wasn’t there. “I called Jay (Quail, executive director of the CCCA) and said, ‘Hey, we have a meet at Auburn which is the classic car capital of the world, why don’t you guys meet with us there? We have the space and the facility and the infrastructure,’ and they just jumped at the chance. “We can have a lot of fun by joining forces,” Moskowitz added. Might this be just the start of more joint efforts?